Now that's a lengthy title. It's so hard to label a dish when it has a million different things in it. Do you just go with an broad title like "...with roasted veggies"? Or is that too general and doesn't really draw you in? Do you highlight the fact that there is meat in it? Do you include the type of dressing too? I don't know, what's the most important thing to highlight in a title? I think anything can be catchy, but it all depends on the readers mood at the time. Personally, I am about the visual. If I see a title that has 'roasted veggies' in it and I see that there are vegetables I like in the picture, then I'll totally check out the recipe. What draws you in to a recipe? Now that we figured that out (or not), let's talk about this salad. I am all about the salads with a grain in it. I find it to be more filling, and overall more satisfying. So when I was flipping through cookbooks while menu planning last week, I came across this recipe. I was immediately drawn in, despite tofu being in the title. We aren't tofu eaters, but you can always substitute chicken. 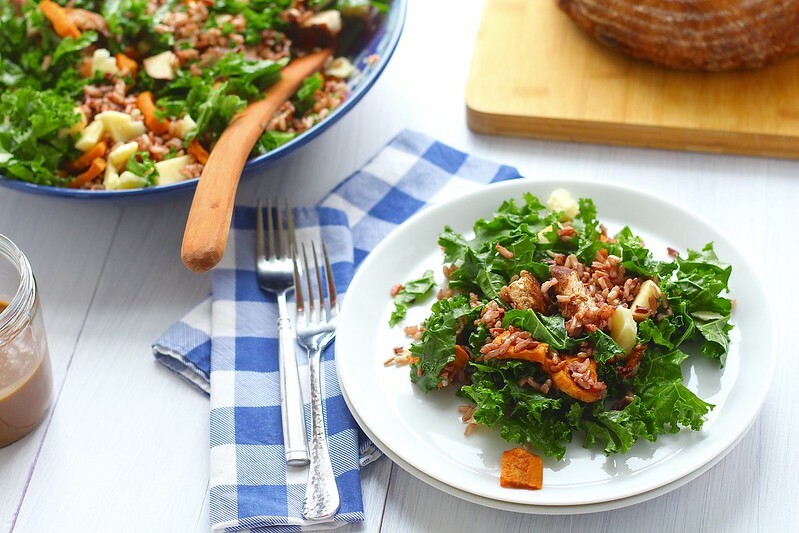 This salad is satisfying, filling and overall delicious. You have so many flavors going on, but they all work together harmoniously. 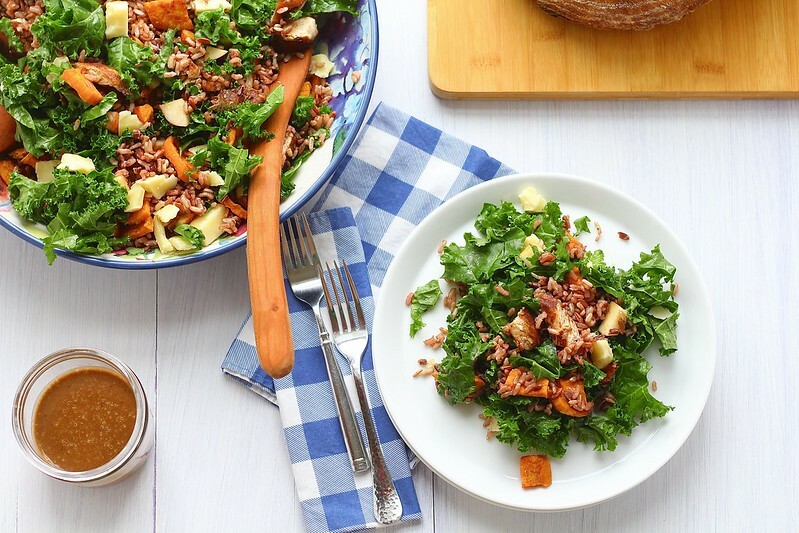 You have the sweet/tart apple chunks, earthy roasted sweet potatoes, and tangy vinaigrette. This would be great to bring to a summer gathering, you can make big bowl of this quite easily. And it's served at room temperature, which is a bonus. This makes a great lunch, or a light dinner. I served this alongside some of my favorite homemade bread and we were all happy and full at the end of the meal. Eat some salad, be happy and love summer! Place the chicken in a bowl or plastic bag. Pour in 1 cup the balsamic vinegar, Dijon mustard, honey and a sprinkle of salt. Toss to coat chicken. Place in the refrigerator and marinate for 30 minutes. Preheat the oven to 400ºF. Place the chopped shallot in a large piece of tinfoil. Sprinkle with salt and a few teaspoons of olive oil. Fold the foil to form a closed packet. Set aside. Line one baking sheet with parchment paper. Place the shallot packet on one end of the baking sheet. Toss the sweet potatoes with enough olive oil to coat, sprinkle with salt and pepper and spread out on the baking sheet in an even, single layer. Place the chicken in a small baking dish and pour the leftover marinade over the chicken. Place the sweet potato baking sheet and chicken in the preheated oven. Roast until the sweet potatoes are tender and the chicken is cooked through, 30-40 minutes. Remove from the oven and let cool slightly. Slice or shred the chicken. Meanwhile, cook the wild rice according to the package directions. Let cool. To make the vinaigrette place all the ingredients, including the roasted shallot in a large glass measuring cup. Using an immersion blender or food processor, blend the dressing until completely smooth. Taste and adjust seasonings if necessary. Once everything is cooked and cooled. Assemble the salad. 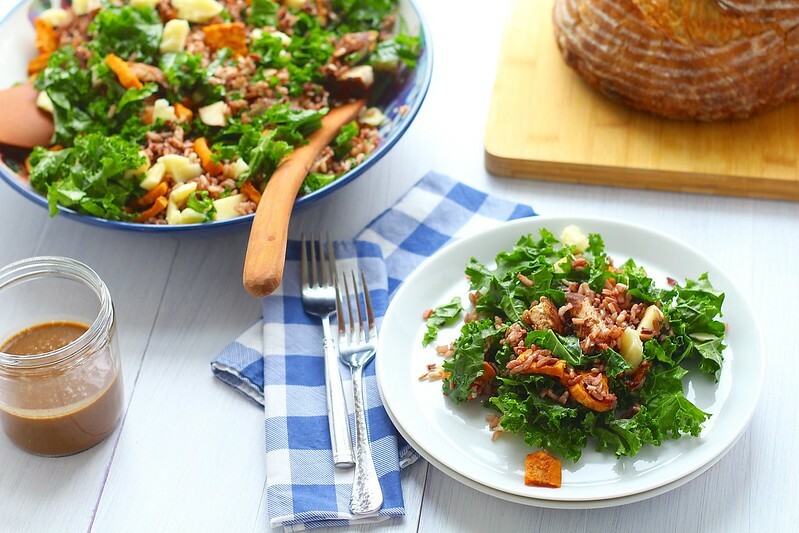 In a large bowl, combine the kale, chopped chicken, sweet potatoes, wild rice, apple and cheddar cheese. Toss with the vinaigrette and serve. Store any leftovers in the refrigerator.